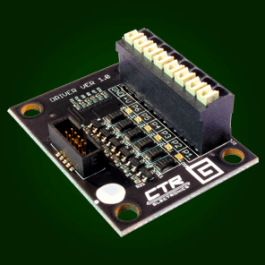 The Gadgeteer Driver Module provides six low-side outputs, expanding HERO's capability to control high-current loads such as solenoids, motors (on/off), LED strips, and more. 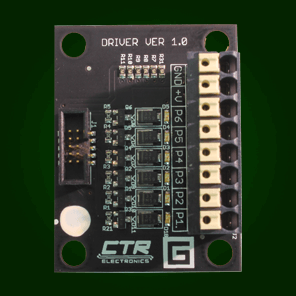 The Gadgeteer Driver Module provides six low-side outputs (each with a peak current rating of 5A). The channels are controlled using general purpose outputs on any HERO Y connector (updated HERO Manual coming soon with examples...). Each channel has an LED indicator allowing you to quickly test/confirm what channels are activated. Output wires are connected easily by using the push-in terminal blocks (no crimps or connectors are necessary). The V+ rail can be connected to your load's high voltage source to protect against high voltage inductive spikes. This is typically done for motors.